The creeeeak of a well-worn lid. The click-click of the ignition. The WHOOSH of red-hot flames coming to life under singed grates. That irresistible charred scent wafting in the summer breeze. These telltale clues signal a cookout in progress. But any good backyard bash isn’t complete until a few wrapped appetizers are grilled above those flickering flames. When wrapped in savory ingredients, veggies and fruits take on a whole host of new flavors and textures. Rich proteins, like spiced prosciutto and peppery pastrami, make great wrappers because their unique seasonings are easily absorbed by fresh produce. To get your creative juices flowing, let’s take a peek at a few protein-wrapped recipes that’ll make you the grill master at your next cookout. A quick side note: you can also bake these. Just plan to increase cooking time, since your oven won’t get as hot as the grill. We put a savory new spin on an Italian classic — caprese salad. 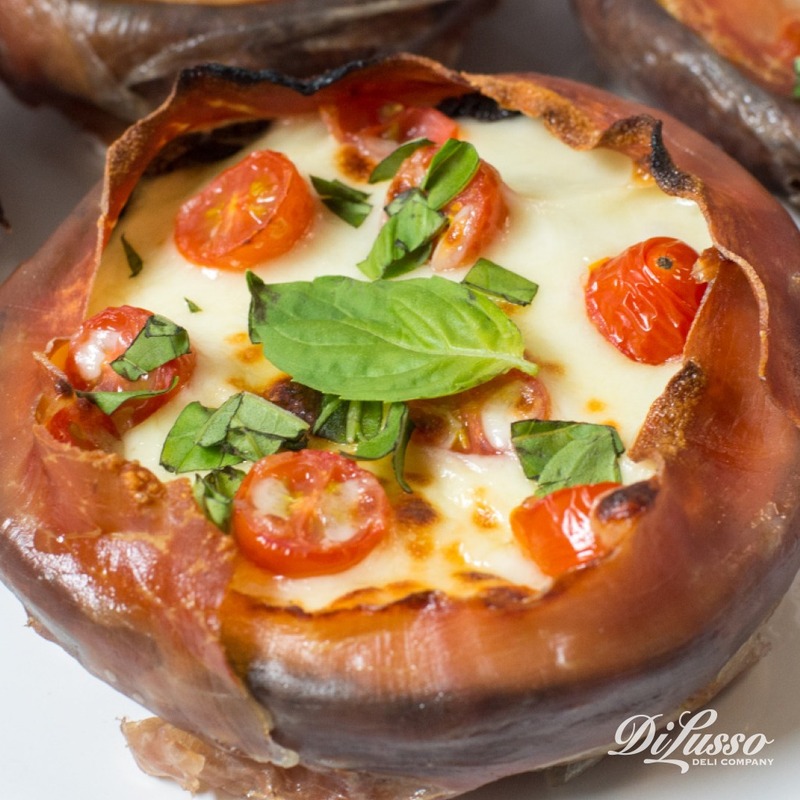 We filled springy portobello mushroom caps with our shredded mozzarella, fresh cherry tomatoes and basil. Then we wrapped it in ultra-thin slices of our dry-cured prosciutto. You’ll probably need to secure the prosciutto with a few toothpicks. Just make sure to soak the toothpicks in water for a few minutes before inserting, so you don’t end up with flaming mushroom caps. As these little bundles cook over the grill, the lush green beans soak up our pastrami’s bold flavors, giving them a peppery yet garlicky taste. 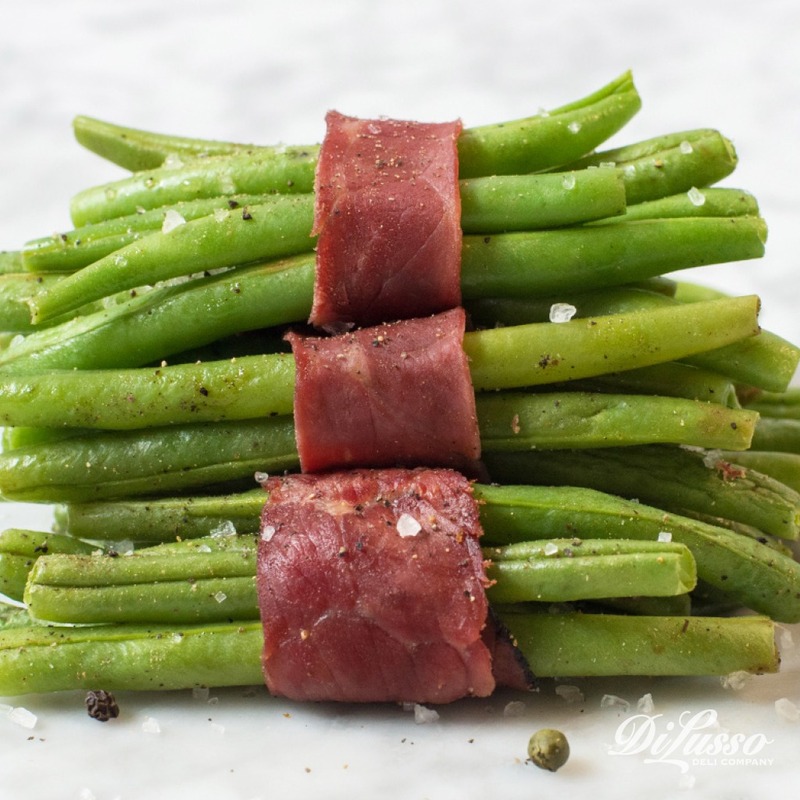 Small pats of butter layered between the green beans and pastrami help lock in moisture and tenderize the green beans. That means no parboiling for you! Grilling these in foil packets has a steaming effect on the green beans, tenderizing them even further. The foil also makes for easy cleanup. After you’ve enjoyed its contents, ball up the foil and use it to scrub your grill. 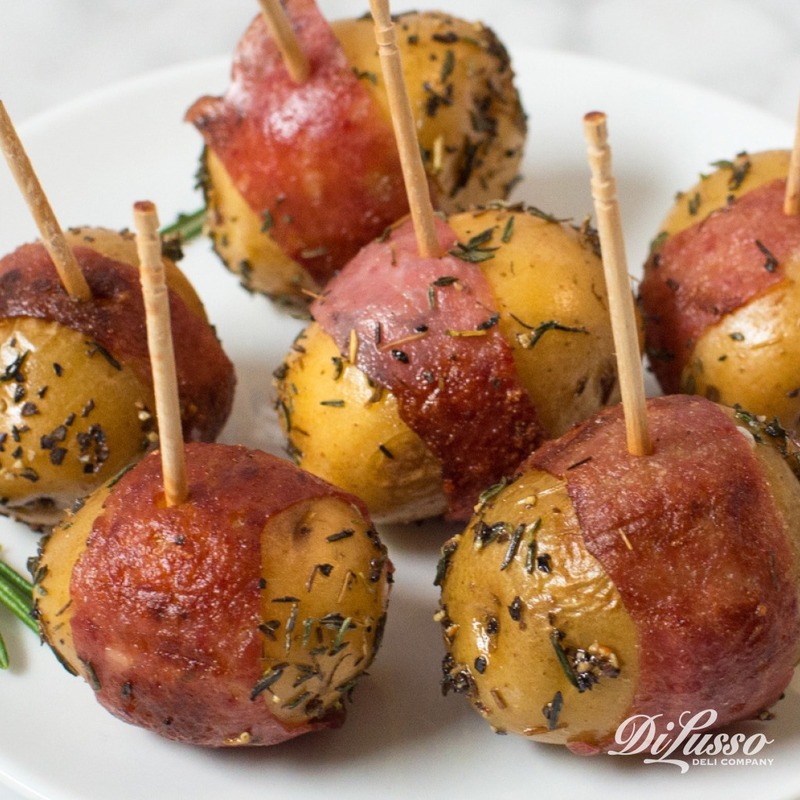 Seasoned with rosemary and wrapped in our rich, garlicky hard salami, these baby potatoes leave the grill saturated with flavor. Plus, grilling them on skewers make them a breeze to cook. Gone are the days of rogue potatoes rolling off the grill. For buttery-soft potatoes, we recommend parboiling them before grilling. Try parboiling on your grill to cut down on the trips you make in and out of the house. Sweet and savory are the best of friends in this one. 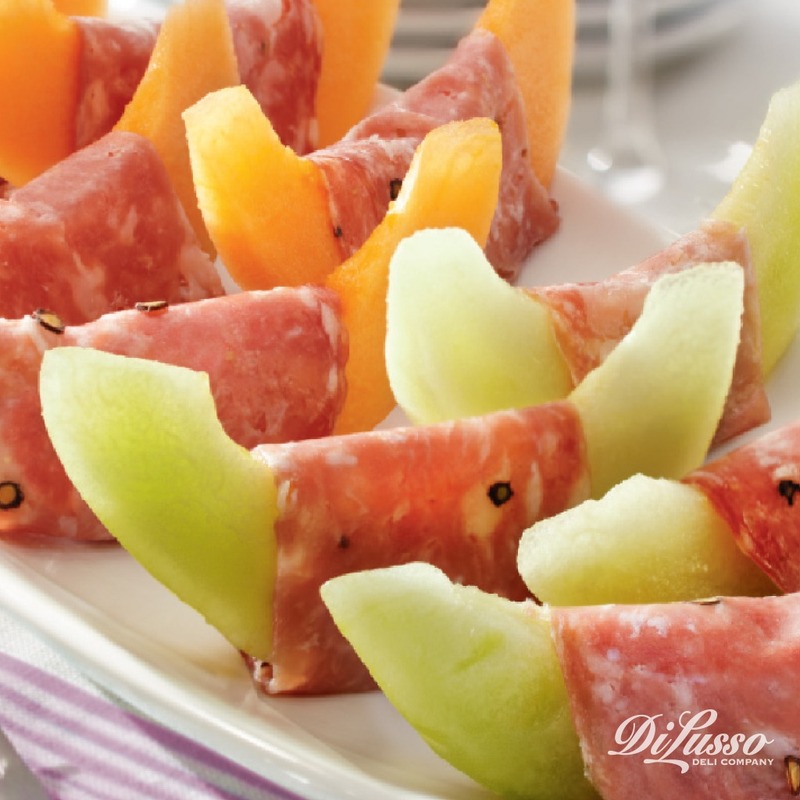 Just wrap cantaloupe in our sopressata, slide onto skewers and grill away. Drizzle with a tablespoon or two of balsamic vinegar for a splash of sweet tartness.